The treatment of certain brain tumors just got faster and more effective thanks to a powerful new stereotactic radiosurgery system at Huntsville Hospital. 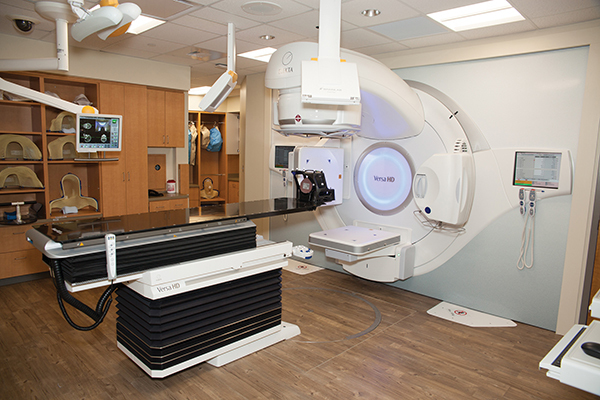 Alliance Cancer Care in the hospital’s Blackwell Medical Tower is the first medical office in the state, and one of only 10 nationwide, to pair a latest-generation Versa HD linear accelerator with ExacTrac advanced image guidance. Radiation oncologist John F. “Jack” Gleason Jr., MD, medical director of Alliance’s radiosurgery program, said the new system ensures that the radiation beam hits only the tumor, which allows better preservation of the surrounding healthy tissue. If a patient has more complicated brain lesions or a condition like trigeminal neuralgia that can be treated with either radiation or surgery, Alliance’s physicians and the neurosurgeons at Huntsville Hospital Spine & Neuro Center collaborate on a treatment plan. Holly Zywicke, MD, is medical director of the neurosurgery side of the partnership. Because the new linear accelerator delivers radiation in higher doses than conventional radiation therapy, it can also kill a brain tumor in a fraction of the time. Instead of 30 or more visits spread across six weeks, many patients treated with the new radiosurgery system will need a single non-invasive treatment lasting about half an hour. The new system also eliminates the need for one of the most unpleasant parts of radiosurgery: head frames. With many older systems, a large frame would be attached to the patient’s skull with bone screws. The frame provided the coordinates needed to direct the radiation beam to the tumor lurking inside the brain – but it could be painful. Physicians now instead use image guidance from MRI and CT scans of the patient both before and during treatment, along with the ExacTrac system which gives instantaneous feedback on patient position in all six dimensions, to make sure the radiation beam hits the target with an accuracy of less than a millimeter. The term “radiosurgery” is a bit of a misnomer since it’s not a surgical procedure. There are no incisions, and the patient remains awake while the radiation attacks the tumor. “Patients don’t even feel the treatment,” said Dr. Gleason.